Oils: Olive oil. Organic Coconut oil, and Hawaiian Macadamia nut oil. Colorant: herbs, clays and charcoal. No synthetic colorant. Scent: Pure essential oils. No synthetic fragrance and perfume. “Superfatting” is the soap formulation with more oil molecules than alkaline molecules. Excess unused oil molecules free up and left in the soaps. This is the secret to why our soaps are so gentle and moisturizing to the skin. -We use the cold process method to produce our bar soaps. The cold process method is a traditional way to make soap that has been used for centuries. The cold process method doesn’t heat up and damage the soaps ingredients so the finished products have all the natural nutrients intact. -Another benefit of the cold process method is the natural glycerine by-product. Most major soap manufacturers remove glycerin from their soaps and sell it to be incorporated into cosmetics as a moisturizer. 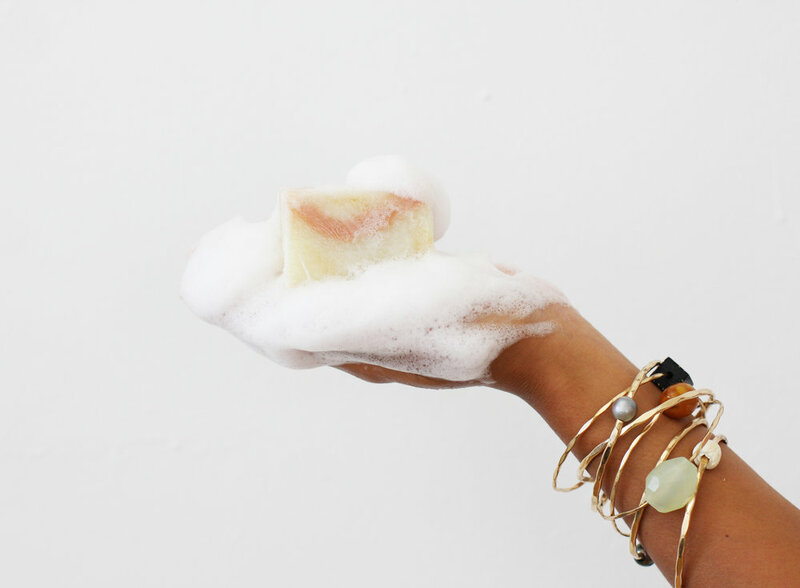 ʻAuʻau soap retains all of its natural glycerin that nourishes and moisturizes skin. -The cold process method takes four weeks from start to finish. Many companies have given up the time consuming method. We believe the cold process method makes the highest quality soaps and good things take time. All of our soaps are made in small batches by hand in Hawaiʻi nei.